As shown previously by AstraZeneca in Nature reviews*, one third of the safety failures is linked to central nervous system (CNS) toxicity observed during the clinical trials. This assay can be performed by cell imaging in HCA/HCS on brain cells, including neuronal cell lines like SH-SY5Y and Luhmes, or iPSC-derived human brain cells . Neurotoxicity assays are performed by treating neuronal cells during at least 48 hours with the tested compounds. Differentiated SH-SY5Y and CNS4U® cells (iPSC-derived mix of human brain cells) were exposed to increasing concentrations of colchicin during 48 hours in 384-well plates. 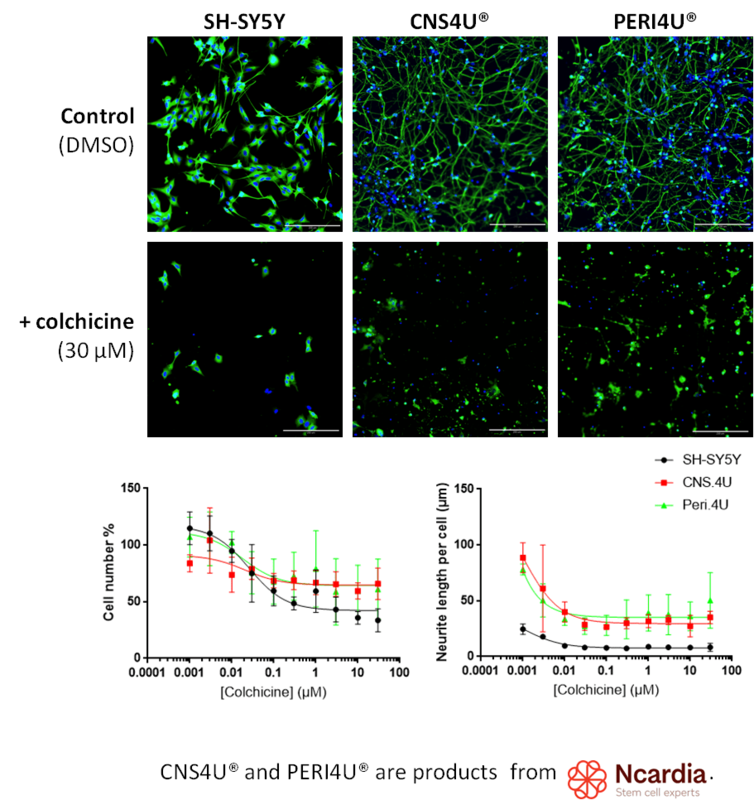 After the treatment, cells were fixed and stained for ß3-tubulin (for neurite length measurement) and Hoechst (for nuclei vizualisation) for fluorescence microscopy observation. Images were analyzed with MetaXpress software (Molecular Devices) to assess the cell numbers and neurite lengths in all cultures. Don’t hesitate to ask for our short report on neurotoxicity assessment using SH-SY5Y and human iPSC-derived brain cells exposed to our in-house neurotoxicity library!